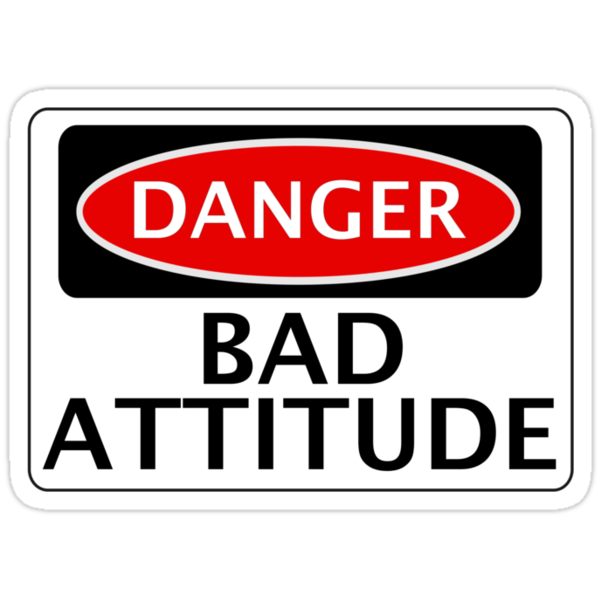 Can A Patient Have A Bad Attitude? A bad attitude can be a symptom of depression. Depression is a mood state we psychiatrists treat. So, is it possible that a psychiatrist says to a patient “the reason you are not getting better is that you have a bad attitude,”? As the story relates to me, I have no way of knowing the validity of that tale, but I want to take a moment to consider the notion of a psychiatric patient with a “bad attitude”. The idea feels so shaming and so blaming to me, I can hardly believe a psychiatrist could express this notion, and yet, at the same time, as more psychiatrists are “pill-mills” and as we know that our pills have limited efficacy, the frustration from the psychiatrist could translate to blaming the patient. Maybe we do not understand our tools, or for that matter, the human mind, enough to understand why people either get better or do not get better. Can we accept that amount of humility in our profession, or do we need to assume that a poor outcome has to do with the patient? The absurdity makes me laugh. If the patient had a “good attitude” what is he doing in our office? We treat “bad attitudes,” not by being accusatory, but by trying to understand the underpinnings of this “attitude,” or to put it another way, we try to understand it in historical context. Of course, historical context takes time and energy, along with carefully honed listening skills, a set of strengths that are no longer taught in Psychiatry Residencies, leading, to what I see, as professional suicide for all of us. The hard truth is that when our pills fail, which they often do, we must be able to use listening skills to help patients sort out their mental suffering so that they can have a narrative which helps them navigate their life, both past and present. If we lose these skills, the job satisfaction will be poor, and patient satisfaction will also be poor. The result, as I see it, will be a complete disillusionment with the field. There, I have ranted again. I just cannot say this too many times or too many ways. The state of my profession is dire, and we need to have an open discussion before we die completely. That is my hope, that these posts will stimulate a forum to push back and encourage psychiatrists to listen deeply, to learn how to listen in a therapeutic manner. The “good ol days” were indeed better than our present. I maintain that point of view and I am open to talking about that further. The gauntlet has been laid. I wait. Marketing psychoanalysis used to be an unspoken taboo, meaning that patients were supposed to come and seek our intensive help, rather than clinicians seeking patients to treat. This worked well when the supply of psychoanalysts outstripped the demand. In the 60’s and 70’s, and even in the 80’s most analytic institutes did not allow non-MDs to enter training, thereby limiting the available psychoanalysts. Further, in the 60’s psychoanalysis was a popular treatment modality, particularly in big cities in which it was fashionable to say, “my analyst says….” There was status to having an analyst and there was a sense that as a result of being in analysis, deeper creativity and deeper meaning in life could be obtained. Further, many insurance companies paid for the treatment, so the cost was not a big issue for some, leaving only the large time commitment the major barrier to care. As time marched on, the 90s brought us SSRIs and with that limited insurance coverage for psychotherapy. In the 80s, non-MDs sued the American Psychoanalytic Association for discrimination, and they won, opening the doors to non-MD therapists to enter in psychoanalytic training. Now, we have many more providers and much less demand, creating a situation in which marketing is essential to prevent professional death. Yet, how do we teach marketing when our senior colleagues find marketing offensive, in that it might diminish the élite aspect to the field? Marketing gives up the notion that we are a sought after commodity. It makes us be more honest with our environment, which of course, is what psychoanalysis claims to do to help patients. This massive shift in supply and demand is the subject of my class entitled “Building A Psychoanalytic Practice.” As I come to the end of my seminar, I hope to convey that our hard-earned psychoanalytic skills cannot be honed unless we have patients, and we can’t have patients unless we announce to the world what we do. Supply and demand has flipped since psychoanalysis came to America. We either adapt or die. It is that simple. How do you make a psychoanalyst? No one knows, is the short answer. The tradition has relied on a tripartite model in which the student, a licensed clinician, enters into a personal analysis, attends four years of classes which are four hours a week, associated with one-hundred pages of reading per week, and has three psychoanalytic case control patients, which means three patients come four times a week, and each of those patients is associated with a supervisor who discusses the clinical work. This is a daunting task for most students who have loans to pay and children to raise, and yet, year after year, the five psychoanalytic institutes in town, get students, and every year there are students who graduate, now thinking of themselves as psychoanalysts. To paraphrase Mark Twain, the reports of the death of psychoanalysis are premature. Having said that, there is no agreement about how to develop a psychoanalyst, or how to develop a psychoanalytic practice, and yet, my task is to teach this subject to first-year students. As you could predict, I pull the curtain back and expose the fact that we do not know precise definitions of a psychoanalyst or psychoanalytic treatment, but we accept that we work in a fuzzy field, in which we cannot scientifically prove that we offer help, and yet, we have the conviction that we do. To work with conviction sounds awfully like a religion, and so we discuss that too. In essence, we have, what amounts to apprenticeships, where students find mentors who guide them through their work, and so traditions are passed down, which may or may not be helpful. The student, I emphasize, must find the path that makes sense for them. This provides little comfort, as the mandate is purposefully vague. I have one more class to teach. My students are enthusiastic and confused. I think I did my job. The grey areas of life tend to be the most anxiety provoking. The desire for a black and white world is universal, and this desire increases under stress. Tolerating mixed feelings, as a parent, as a spouse, as a professional, is the challenge of deepening one’s psychic existence. Tomorrow, as we explore the prospect of building a psychoanalytic practice with new students in the profession, we will discuss how, just like with our patients, the biggest obstacle may not be the fees requested from patients, the time required from the patient, but rather self-sabotage, the reluctance in these students to push forward with their stated goal for career development. Clearly, the patient has fears about deepening psychic work in that the digging up of past experiences can be fraught with pain and anxiety, but perhaps less well known, is the fear in the analyst which makes the psychoanalyst half-halfheartedly promote intense psychological discoveries. According to Roy Schafer, becoming an analyst entails an unending effort that includes tolerating confusing uncertainties about our understanding of our patients and our role in effecting therapeutic change. In other words, the psychoanalyst, but first accept a lack of understanding of his patient, and second accept that if he does understand his patient, he may not be able to bring about symptom relief, or psychic growth. According to RS Wille, the analyst must trust in the relationship between patient and analyst and in the analytic setting as sources of meaning. He suggests that in varying degrees, all analysts struggle to maintain their analytic identity. Lena Ehrlich says we, as psychoanalysts have a reluctance “to recognize the limitations of our influence and how, despite our best efforts, our patients are ultimately responsible for how they lead their lives.” This is challenging work because the psychic arena, the material in the office, as described by Parsons is make up of “symbolism, fantasy, transference and unconscious meaning.” As such, psychic reality becomes the domain, a reality that cannot be proven by fact, but rather can feel right, or resonate with the patient. It is this search for resonance which guides the work, but this search comes with great humility, that resonance may or may not reflect deep meaning. In essence, working as a psychoanalyst stems from a conviction, not a science, not a religion, but a conviction, that engaging with people in a deep way, keeping the patient’s interest in the foreground, allows for psychic growth. This conviction is shake-able, and so we, as psychoanalysts, must allow ourselves to question and consider alternatives, while at the same time, remind ourselves that all intense relationships are ambivalent, even therapeutic ones.